The All Progressives Congress, APC, has been doing its utmost best to distance itself from the failures of past administrations, and instead, push the blame to where it believes it truly belongs. 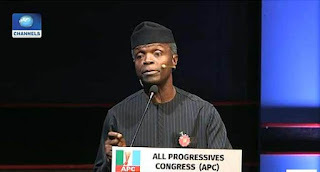 At least, that's what Vice President Yemi Osinbajo has just done in a statement he made at the 11th Bola Tinubu Colloquium in Abuja on Thursday. The Vice-President accused the Peoples Democratic Party (PDP) of wasting the resources of Nigeria for the past 16 years, saying that the administration of President Muhammadu Buhari is making efforts to get things done right. He promised that the All Progressives Congress (APC) government unlike the PDP, will take Nigerians to where it promised them during its campaigns. He also said that Buhari is not an orator and he never claimed to be.